Within the broad spectrum of professionals that can end up in knowledge management positions, the taxonomist is a pretty narrow specialist and more likely to have an information management background. A taxonomist can help you organize your information by creating order where there is chaos and potentially greatly improving access to existing information. Taxonomists, on their own, cannot create miracles. To be effective, taxonomists must either be skilled change agents or partner with change agents within the organization. In addition, they need to collaborate closely with the IT personnel to make sure the tools and taxonomy are compatible and in sync. It's readable for the non-taxonomist like myself and it gives you a good sense of why you might need a real taxonomist at some point. It definitely pushed the boundaries of what I already knew. In other words, I learned something new. Where have I used my accidental taxonomist skills? Admittedly, I've used my limited taxonomist skills rather poorly on this blog. I have not developed a consistent approach to the labels attached to each post. I use a personal wiki (TiddlyWiki) where I am much more rigorous about tagging each entry with a consistent set of keywords. Over time, this has proven very useful. At work, supporting projects with lessons learned activities, I have developed a purposefully simple taxonomy of terms associated with lessons learned. Since my focus is on project management lessons learned, I used a combination of standard project management terms (schedule management, cost management, risk management) to which I added some organization-specific terms (integration and testing, technology development, etc..). I also developed a specific taxonomy for the lessons learned emerging from business development efforts. In the context of the ongoing training of my successor at my current position, having developed taxonomies for her to use (and not recreate or start something from scratch that would not sync with existing databases) should be very useful. Anyone who has attempted to organize the contents of a shared drive has essentially developed a mini-taxonomy and in the process, has very likely encountered some of the common pitfalls. Know your limits as a "taxonomist" and seek help when appropriate. 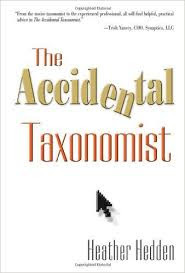 When developing a taxonomy, start small and simple. Develop over time, as needed. Don't over-complicate the process or the final list of terms. Always listen to users and how they react to terms. Working collaboratively with organizational units will mean working with personnel who are not familiar with taxonomies (or knowledge management in general). It takes a lot of well-thought out effort to communicate the basics of taxonomies and to get the process started on the right foot. Learn how to organize and use the "labels" in this blog more effectively. Figure out the functionalities that I'm not yet using. Do a word cloud based on the labels. Revisit the taxonomy I'm using for my internal consulting wiki on a regular (perhaps monthly) basis so that it stays fresh and I use it with sufficient rigor.